The 17 Sustainable Development Goals (SDGs) adopted by the United Nations are focused on ending poverty, protecting the planet and ensuring prosperity for all by 2030. These are what are sometimes called BHAGs (Big, Hairy, Audacious Goals) in the business world. Big aspirational goals are exactly what is needed to reimagine, reinvent or in some cases retrofit our precariously unbalanced world. Goal #3: Good health & well-being – using biochar in soils can immobilize certain metals and toxins and reduce the need for chemicals in soils. Using biochar to filter storm water can reduce E.coli and other bacteria. See the Warm Hearts example in Thailand on replacing chemicals in agriculture with biochar. 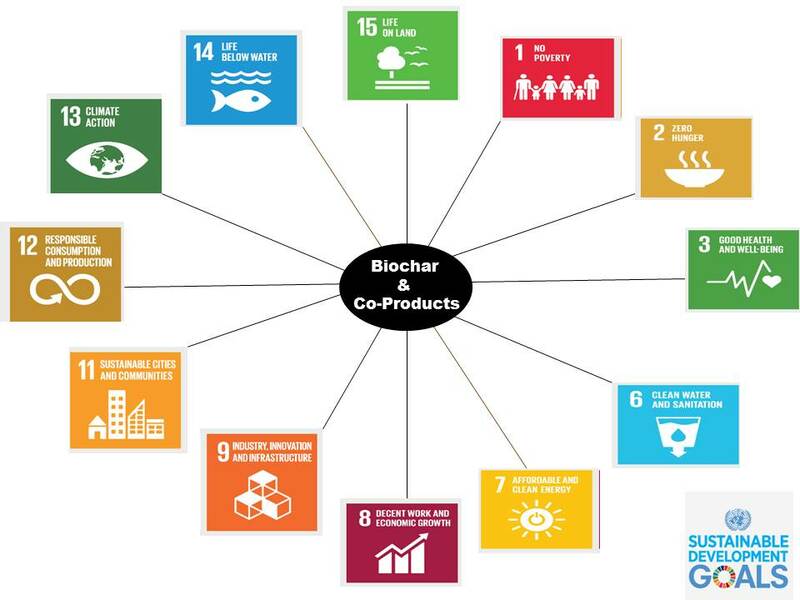 Goal #6: Clean Water & Sanitation – using biochar as a low cost water filtration medium can reduce negative impacts of unfiltered effluents. Carbonizing sewage sludge is a way of reducing volume and immobilizing toxins. Goal #7: Affordable & Clean Energy – a growing number of biochar production technologies can be used to produce heat and/or electricity and/or syngas. Goal #8: Decent Work & Economic Growth – carbonizing underutilized biomass which is commonly burned in open fields creates economic opportunity for farmers and other rural inhabitants. Goal #9: Industry Innovation & Infrastructure – new biochar uses include building materials (e.g. concrete, bricks, asphalt) and other composites. Incorporating biochar has been shown to improve various properties of both concrete and asphalt thereby extending the potential lifespan of the materials. Goal #11: Sustainable Cities & Communities – biochar has been shown to benefit storm water management, green roofs and urban tree planting. It could also be used to remediate urban brownfields. Goal #12: Responsible Consumption & Production – converting waste into biochar and using the char to displace high carbon footprint or non-renewable or expensive materials will lead us away from a linear economy to a more circular one. Goal #14: Life below Water – adding biochar to soils can reduce nutrient leaching which is responsible for significant eutrophication around the world. Goal #15: Life on land – reclamation, remediation, restoration are all ways that biochar can improve life on land!